As a teacher and therapist for children under the age of 5, the number one question I have always encountered with parents is “how do I get them to stay still?". Well folks, every child is different and I can’t (unfortunately) give you fairy dust to sprinkle on your adorable tot to get them to magically stay still. However, I have found a few tricks that have worked wonders with kiddies to at least pay attention for 3-5 minutes at a time (we have to start somewhere). I say “pay attention” instead of “sitting still” because for toddlers, it would be nearly impossible to see this double rainbow like moment happen (unless asleep, ill or so exhausted they can’t even keep their eye lids open). However, paying attention and listening can definitely be done – with the right tools and clever ways of persuasions. Here are a few tricks I have used with my adorable tots. Find the best motivator. You know your child. You know their likes, dislikes and favorite toy that they won’t let go of. You know, the toy that’s so dirty and stinky that when you finally cleaned it, your baby didn't recognize it anymore. As amazing as that toy is to your toddler, it will not be a great toy to use as a motivator to get their attention. It may become a problem rather than help, since the focus will stay on that “beloved” item. Instead, find something that is fairly new (tip: introduce toys that light up, spin and anything that can be easily manipulated with their hands – play dough, slinky etc). When you find this magical motivator toy, it will most likely keep their attention for several minutes (until they find something else to do or start fighting with a sibling of course). Be animated. When you find this magical tool, try playing with the toy along with your child. Remember, toddlers will learn through you. They will learn with a bit of guidance, as well as independent exploration. It is so important to spend this time with your tot, and when you do, don’t be afraid to be silly and animated. We don’t mean scary little girl/boy voice – unless you do that really well. We mean: hopping on one foot to teach balance or singing while cleaning to make it more fun. By creating a fun and animated environment, your child will only have eyes for you, which will allow for many wonderful teaching opportunities that they will gladly listen to since you made it so much fun! Consistency is key. Once you have created this fun and animated teaching environment, be consistent. Try sitting and playing with a toy for 2 minutes, then 3, then 5 and so on. Believe me, it will not be a cakewalk in the beginning (for some children). While you play with the toy start asking simple questions, and see how they respond. 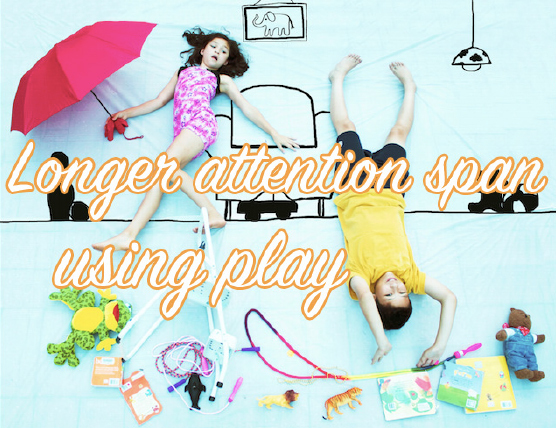 Remember not only are you teaching your child how to have longer attention span and how to play appropriately, but these are also valuable teaching moments that can be extremely powerful if used effectively and can transcend to other activities besides play. The key to this exercise is to be SO interesting that your child will not be able to ignore you. We know as parents, your energy may be low at times and these exercises cannot always be done with as much animated zeal as you would like. However, for every small effort a large return can be given. We hope this helps. Play on! My name is Debbie. I am a therapist for children with Autism and past Art teacher for toddlers. I am the founder of Lollie Tot a children’s site where we show fun tutorial videos for parents of young toddlers that will help promote learning through natural play. Toys and other wonderful items will be available for purchase where portions of the proceeds are given to children’s charity organizations. We will be launching October 27, but sign up at www.lollietot.com to be the first to see our brand spanking new site!